Please view pages in our Smile Gallery section to view photos of some of our patients who had life-changing treatments at Vadadent Modern Dental Group Vadadent Modern Dental Group Phone Number 310-371-4104. 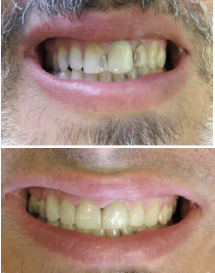 Cosmetic work: patient needed Root Canals, Dental Crowns, and Porcelain Veneers. Before and after: 65 year-old female received nine front teeth porcelain crowns. 60 year-old male presented for replacement of front crown. The new CEREC crown was fabricated in-office in one hour and delivered to patient!